If you hear “meal timing” and immediately think about pounding a protein shake immediately after a workout, you are definitely not alone. For a very long time that “window of gains” was considered to be one of the biggest players in reaching strength and body composition goals. But, in the last 10-15 years the focus has shifted away from meal timing towards overall intake and individualizing timing based on goals, schedules and, overall sustainability. We’re learning that meal timing may not necessarily be crucial for everyone and just like most things in life, it really depends on what works best for you. This takes a little self-experimentation so we’re going to break it down for you with some general ideas and recommendations. First let’s define meal timing. At its most basic level, meal timing (also commonly called nutrient timing) means eating a specific nutrient in a specific amount at a specific time for a specific reason. When Meal Timing May Be Helpful. Everyone’s lives and schedules look different, which means that meal timing is going to be individualized. If you wake up at 4:30 am, your meals throughout the day will probably look very different than they would if you were waking up at 8 am. If you are trying to lose weight you may have to be more intentional with how you space your macros through the day to avoid hunger versus someone who is training to gain mass. There are so many different things to consider. Keep you energized throughout the day. Improve your mood, positivity and mindset. Help you focus and be more productive. Facilitate a great night’s sleep so you can recover and do everything again tomorrow! Carbohydrates can be “high-glycemic” or “low-glycemic”. There are a lot of different things that play into where a food falls on the glycemic index like what other foods you eat with it and other nutrient levels in your body. In general, high GI foods have a higher carb content and spike your blood sugar faster than low GI foods. Low GI/high-volume foods should be eaten throughout your entire day because they will keep you feeling fuller, they won’t take up a ton of your macros and these foods also most often accompany a high micronutrient level. These micronutrients (like magnesium, calcium and all of the vitamins, just to name a few) are major players in a majority of your bodily functions so they’ll keep you feeling your absolute best! Some examples of low GI foods are berries, zucchini, leafy greens, and the others we mentioned in the Eating for Volume section. High GI foods can be manipulated to fuel and recover from workouts but you can also use them to feel your best during the day. If you’re pretty active and using a lot of your energy, it can be helpful to eat a combination of high and low GI food either before, during or right after the busiest part of your active day! Some examples of healthy, high GI foods are whole grains, potatoes and fruits like pineapple and bananas. Keep your protein intake steady throughout your day. This means dividing your protein target evenly across all of your meals. Protein helps your muscles build,recover and keep you feeling full. This is why eating well balanced meals is a great habit to get into. Like we chatted about in the protein section, your muscle rebuilds while you sleep – but did you know that you lose more muscle during sleep than when awake? This makes adequate protein at night really important, especially if you are very active. To aid your overnight recovery, eat casein protein before bed. Grab some ideas from our blog articles Late Night Protein Treats for Recovery or Eating and Sleeping for Recovery if you want to get creative! Fats are extremely important for the healthy function of the cells in your body and is the major player in your body’s absorption of vitamins and mineral. Some vitamins are “fat soluble,” meaning that fat needs to be present for the uptake of that vitamin (fun fact: vitamins A, D, E and K are the fat soluble vitamins). Fat is also a player in keeping you satiated, which is why we crave fatty food when we’re particularly hungry. It slows the digestion of food keeping you feeling full for longer. Keeping fat intake consistent throughout the day is a good idea to keep hunger under control. Fat is great for curbing hunger because it slows digestion, but if you eat fat rich food with your pre-workout carb source your body may not be able to access that fuel immediately. Keep fats outside of your workout. Identify your “hungry times” throughout the day and plan snacks for those times to avoid periods of hunger. When you’re hungry you’re more likely to reach for macro-dense (aka high carb, high fat) choices that will leave you unsatiated and hungrier in the long run. The longer the duration of your activity, the further you should spread your intake of high GI (fast releasing) carbs over your day. This will help to keep your energy up and your glycogen stores full. Polls have shown that it is generally easier to deal with hunger in the morning than at night when you’re trying to fall asleep! If you find that you’re hungry before bed, try making your breakfast smaller and your dinner larger. Or, push all of your meals back a few hours. Overall intake of your macronutrients, with most of it coming from whole, micronutrient dense sources, is going to be the biggest player in feeling strong in your workouts and quick in your recovery. If you are eating too much or too little of a certain macronutrient, the timing of those nutrients won’t have the effect you are hoping for. Starting with the basics and nailing down those macros targets is the first step. If you’re consistently hitting your macros, timing your intake (particularly carbs) around your workouts can be beneficial and take you to the next level. A WAG coach will take your individual goals and training into consideration to help you work out the best nutrient timing for YOU. Just like your macro targets, the timing of your nutrients will be completely individual based on your “optimal performance”. But, we have a few good starting points for you. This time-frame gives you time to digest and properly fueling for your workout provides necessary macro and micronutrients for physical and mental energy. This meal is also important for supplying your body with vitamins and minerals for optimal organ and muscle function. Protein Exercise damages muscle tissue, but protein keeps amino acids stocked while promoting protein synthesis. Make sure this meal includes a bit of lean protein. Carbs Whatever the workout (long, short, endurance or resistance) eat a mix of high and low GI carbs, for example, grains with leafy greens. Fat Fat slows the digestion of food. This meal is intended to prime and prep the body, and slowing digestion will keep that from happening. Incorporating some fat in this meal is okay, but try not to overdo it. Eating earlier is optimal but if you’re unable, eat immediately before. If you’re doing a workout that is 2+ hours long it may require you to eat/drink mid-workout. Protein is important and we recommend opting for a whey protein shake. Whey is also fast digesting. We like Ascent Whey Protein for quality. Carbs: With less time to digest whole food, stick with high GI carbs. Examples include, but are not limited to, white rice, fruit, baby food, fuel pouches and carb/protein shakes. They digest easier and absorb quicker. For a refresher on the glycemic index, refer back to Carb Timing For Life! Fat:Avoid high fat in this meal. It further slows digestion which is time critical at this point. This meal enhances your recovery for the next day, which is important if you workout frequently. Protein: Eat ASAP! Protein will continue promoting muscle maintenance and growth. Carbs: Carbohydrates replenish glycogen stores, particularly after a heavy workout. Sticking to high GI carbs will be especially beneficial at this time. If you workout multiple times or go to your job afterwards then carb intake is extra important. Fat: Digesting the carbs and protein you consume immediately post workout is important, so keep fats low in this meal. This meal keeps you recovering from earlier workouts and if it is one of your last meals of the day it also prepares you for a good night's sleep. This is important because certain recovery is specific to sleep! This recovery also ensures proper preparation for tomorrow’s workout. This is the best time to eat essential macronutrients, micronutrients, vitamins and minerals that you didn’t eat around workout times like fats and more fibrous vegetables. Protein: Especially slow digesting protein, like casein, is ideal for continued muscle growth and maintenance while you rest. Refer back to the section aboutProtein Timing for Life for some fun ways to incorporate casein into your night! Carbs: Low GI carbs keep glycogen and glucose stocked without spiking insulin. In other words, you'll get the benefits of carbs and feel full without the unnecessary spike of energy while you rest. Fats: Time for fats! They keep the digestion and release of carbohydrates and insulin steady. So, the majority of your fat should be eaten during this time window. Fat also transports important vitamins and minerals around your body, required for healthy organ function. Remember, these are general recommendations and your specific needs may vary based on gender, lean muscle mass, what time of the day you train, temperature, recovery time until your next workout and so many more variables! This is why working with a coach who knows your goals and your body is so important. Ready to meet your coach and get personalized recommendations? Let’s get started! The common conception that you have to get in protein and carbs right after your workout (within 30 min-1 hour) really only comes into play if you’re training fasted. 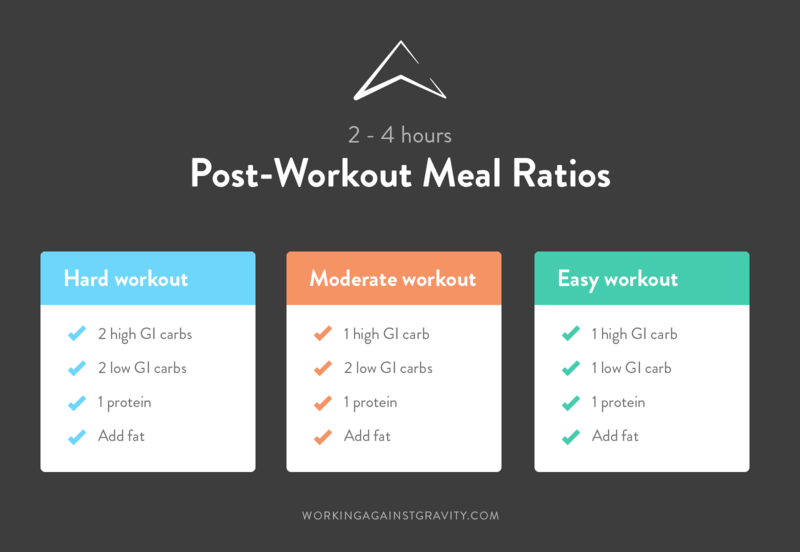 If you’ve gotten a solid protein and carb meal in before your workout that “window of gains” actually extends to be up to 3-4 hours after your workout. a rest day is extremely important! After a few days of working out, a rest day is extremely important! It allows you to recover and repair so that you can get stronger. What qualifies as “recovery” or “rest” can look different for everyone. For example, if you typically train for 2-3 hours a day, going for a mile walk with your dog would definitely constitute as a “rest” day. First, remember that a little hunger is a normal, healthy body signal and to be expected, especially when you're in a deficit or right before a meal. Evenly space protein across the entire time you’re awake. Keep your meals as balanced as possible. If you can add a little fat to a meal, it will slow down the digestion of everything you eat and help you feel satisfied. Eat 5-6 smaller meals instead of 3 big meals. Drink enough water. We recommend 1 oz per pound of body weight. Incorporate vegetables into every meal and use them as snacks between meals. The fiber slows down your digestion and you can eat a high volume of them, so they'll fill your stomach up but not all your macros. Identify your "hungry times" and plan snacks for these times in the day. Limit ALL macros coming from drinks (BCAAs, protein shakes, sodas, high-carb recovery drinks, etc.). Eating your macros will keep you much fuller! If you’re waking up hungry, make sure that dinner is super hearty and/or add a little snack before bed.